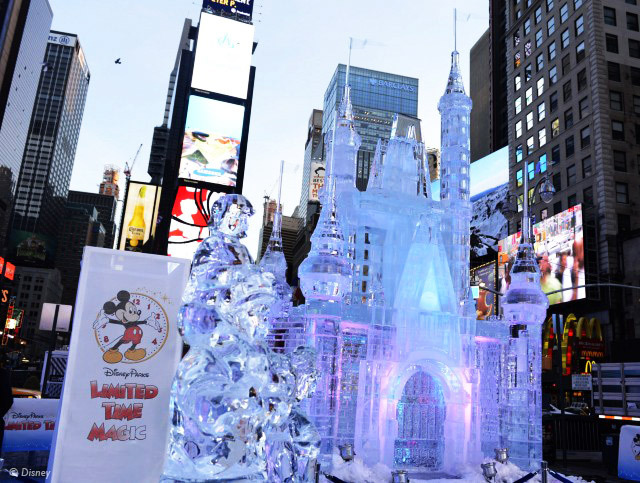 This week, Disney Parks officials announced their new promotion for 2013, “Limited Time Magic”, by unveiling a 25-foot-tall, 45,000-pound castle made of ice over Times Square in New York City. “Limited Time Magic” is 52 weeks of magical experiences, big and small, that appear, then disappear as the next special surprise debuts. Limited Time Magic will take place throughout 2013 at both Disneyland Resort in California and Walt Disney World Resort in Florida. Each week at the Disney theme parks will be highlighted by a different surprise or guest enhancement that will last for one week only. Each weekly surprise, many never-before-seen in the Disney Parks, will include entertainment, dining, character experiences and more. Just like this incredible ice sculpture, and as the name implies, these experiences won’t last long. Each one will disappear after seven days to make way for the next week’s Limited Time Magic experience. There’s no word yet on which experiences will happen when, but some of the magic guests can look forward to includes: an Independence Day celebration that lasts an entire week; the Dapper Dans rocking out with boy band hits in barbershop style; a Friday the 13th dance party with Disney villains that lasts to the 13th hour; limited-edition Mouse ears; and a Valentine’s Day that lasts a week with Disney castles blushing pink, surprise meet and greets with Disney princes and princesses, and candlelit dinners for couples in love. I’ll keep you posted when more information is released.